Beware which way the wind blows. Total UK electricity power demands are made available by the National Grid. A Live control panel can be seen here. These figures are a real eye opener and should be made compulsory reading by lobbyists and politicians. They highlight how the rush for wind is becoming a dangerous experiment. DECC policy may enrich vested interests at our expense but it is doomed to failure because it excludes basic electrical power engineering. Unfortunately I think Prof. David Mackay’s excellent book “Sustainable energy without the Hot Air” is partly to blame. His book is based on good physics but it completely ignores the actual resources, costs and engineering that would be needed. He was honest enough to show that only country sized deployments of renewables could possibly meet demand, but these then would disrupt farming and the countryside. The trouble is that the green lobby actually took him seriously, and he was made chief scientist at DECC. Plans continue for very large components of renewables by 2050. The basic problem for all renewables is simple old fashioned load balancing. 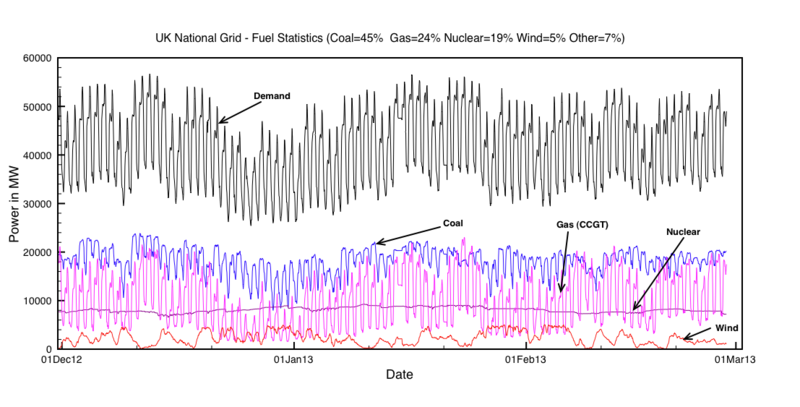 Fig 1: Actual statistics on UK power consumption to the Grid from December 2012 to March 2013 on an hourly basis. Power provided by Coal fired stations are in blue. That from Gas fired power stations are in purple and the contribution from wind is in red. Note the drop off over Christmas and the fundamental uncertainty in power delivery by wind. For the grid to work it must hold in reserve the maximum theoretical power delivery, which for the UK is currently ~70GW. An all renewable grid is completely impossible in a country like the UK lacking truly massive hydro resources. A decarbonized future in the UK without a large nuclear base load is nonsense. In the short term only fossil fuels can dispatch sufficient power to handle the random intermitancy of wind power. Gas is the only resource which can be held in reserve to quickly meet peak demand. Wind is randomly intermittant and if it were to reach more than ~10% peak capacity would threaten the grid with complete collapse as its output fluctuates so wildly. Imagine that by 2050 wind is expanded 10 fold to say 40,000 turbines giving a theoretical peak capacity of 80 GWatts. This would need an investment of about 100 billion pounds plus extra subsidies on electricity costs as we will see. To dispatch power for low wind conditions we deploy only gas as the green lobby have banned nuclear. We can see what that might look like by scaling up the wind figures above. 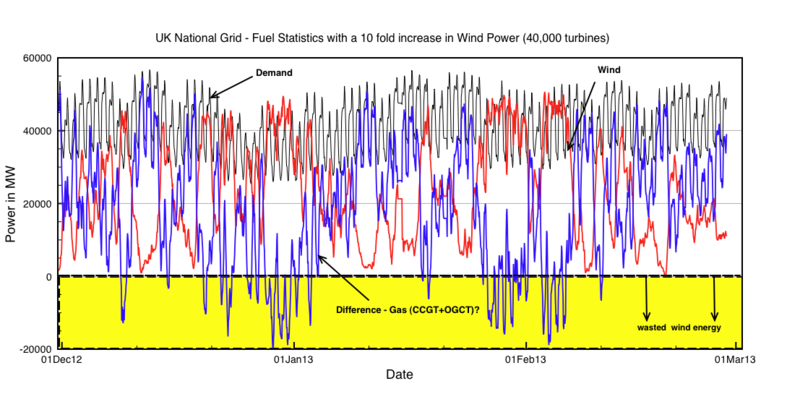 Figure 2: Effect of a 10 fold increase in wind power on the UK grid. The rapid massive intermitancy of wind would need to be offset by fast power delivery from gas generation. A fixed nuclear base load would only reduce the scale of the rapid response needed by Gas. Shown in yellow is wind energy discarded bu still paid for. Fine you say – all we need to do is to develop energy storage for renewables to iron out the intermittency. Note that this energy storage problem has already existed for 50 years. The UK builds twice the number of power stations that it actually needs simply to insure that the lights never go out on the coldest day in winter. We would already be saving billions if there was a simple solution to energy storage, but unfortunately there isn’t. The scale of the problem for large wind deployment is an order of magnitude worse. Furthermore running gas power stations in such a rapid stop and start mode is extremely wasteful in fuel. The efficiency falls fast. Leo Smith shows that the costs rise rapidly and that CO2 emissions also rise in the same way that driving a car through stop-go traffic increases fuel consumption. A grid with 50% load met by wind and 50% met by gas would cost 3 times the current price for electricity and may not actually save any CO2 emissions at all. An analysis of these effect by an electrical engineer Leo Smith can be found here. The current cost in the UK for power generation is roughly 7-8p per KWh. If we were to attempt to deploy a renewable grid offset by Gas, then these costs would need to rise by at least 400% reaching 28p/KWh. To quote from a recent Danish newspaper article. The very fact that the wind power system, that has been imposed so expensively upon the consumers, can not and does not achieve the simple objectives for which it was built, should be warning the energy establishment, at all levels, of the considerable gap between aspiration and reality. Denmark needs a proper debate and a thorough re-appraisal of the technologies that need to be invented, developed and costed before forcing the country into a venture that shows a high risk of turning into an economic black hole. The whole energy debate has become so politicized that it is almost impossible to hold a rational discussion. There are two arguments to de-carbonize energy. The first argument relies on the existential threat of climate change. Independent of whether this is a real threat or not, it still makes no sense for a small country like UK to act unilaterally because it alone can have no effect whatsoever on the climate. So until there is some international agreement the government should not hinder our citizens and industries with very high energy costs all to no avail. The second argument to de-carbonizemore makes more sense. This is that eventually fossil fuels will run out and the world will then have to rely on non-carbon sources, so an effort now is worthwhile in the long run. However we likely have at least 100 years before this becomes an urgent issue. In the meantime there is a related argument that the UK should not have to rely on ever more expensive fossil fuels from unstable countries, and renewables help in this respect. Investment in renewables in this picture is better viewed as an insurance policy against “risks” from climate change and uncertain energy supplies. What insurance premium would you be willing to pay ? The premium is just too high for Wind Power – A highly unstable National Grid costing 28p/Kwh for wind/gas to insure against a possibly beneficial 1-3 deg.c temperature rise. It is far more sensible to opt for 80% Nuclear at 9p /Kwh and a stable Grid – like the French ! This entry was posted in AGW, Climate Change, Energy, Physics, Science, Technology, wind farms and tagged sustainable energy, wind power. Bookmark the permalink. 6 Responses to Beware which way the wind blows. This post has been up for over two months now and not a single person has come out to contradict you, so I can only conclude that you must be right on this one. –	If I sell the few shares I own in the local wind farm cooperative how do I go about re-investing the proceeds in nuclear power ? –	As nuclear projects seem to end up going a factor of two over time and over budget, wouldn’t it be a rather dodgy investment ? –	If an advanced country like Germany, which has very sound reliable engineers, has given up on nuclear, is there really any future for it ? Germany are actually building new coal power stations . Bloomberg writes. UKs problem is that the 2008 climate change act rules out any new coal stations in UK. It was written in the heady days before the financial crash ! Unless the act gets repealed Gas fired stations are the only road left for UK. That is if the green lobby don’t kill off fracking as well. I would not advise investing in nuclear either, since EDF are in a mess building plants in France. The UK doesn’t have the engineering capacity any more. I just checked the national grid WIND power is currently generating just 0.25Gw which is just 0.7% of current demand at 33 GW. This is negligible. Coal (12GW) Gas are(11.5GW) and Nuclear(5.5GW) are keeping the lights on ! Still the subsidies for WIND are running are 2 billion/year so it is still a good investment in the short term at least until the first power cut. Many thanks for your replies. So have the German scientists and engineers worked out that the CO2 emissions will make little difference, or are they planning to spend more energy capturing them and pumping them back underground? Energy storage hasn’t been taken seriously up until now as there was no need whilst energy was cheap but as the cost of gas spirals there will be a lot more urgency. UKPN among others are currently doing work to install storage at a DNO level and I expect it to grow rapidly. Could Peter, or somebody, explain what “storage at a DNO level” means ?